Gashumba’s father is a Rwandese by race, he had lived and worked in Rwanda as a Chef but because of civil wars, he fled to Uganda in search of peace and access to better social services, and he later found a job working for AVSI Volunteers but later they had to leave for Italy and he was left unemployed, It was then that Rose Director Meeting Point International (MPI) saw him, and she employed him to work at her home. With a good relationship, Gashumba Emmanuel got an opportunity to be supported by Meeting Point International right from his childhood and at the age of five; he attended his Primary level of education at St. Kizito Primary School Bugolobi. Having completed his Primary level, he joined secondary level in St. Maria Goretti Katende. It was a big school but MPI proposed to him a new school (Luigi Giussani High School) and he was told he would like it. It`s location only made him regret why he had left his former school. Luigi Giussani high school was situated in Kireka Acholi quarters a slum in Kampala city; it was a young school with one building without electricity besides, the head teacher and her Deputy Head teacher were so harsh and strict to students; this made him to think that there was no difference between his former school and the later. Those were the moments in which Gashumba felt life was not interesting because of the challenges and circumstances he was going through in his life; especially the father’s leg that had been amputated because of cancer. With harsh and tough teachers, Gashumba was sinking in bewilderment; it was then that Rose invited him to start attending the school of community that could take place at his school. It was then that he heard the words like love, beauty, happiness, Justice and the value of a person. He could understand nothing but with time, he found a correspondence with what he was being told, Gashumba found happiness. With this feeling of happiness, his school performance greatly improved, school became interesting and gained meaning. He then managed to complete his ordinary and Advanced level of education successfully. While in his vacation, he asked Rose (Director MPI) if there was a possibility of a job so that he could be doing something to support himself and the family. He was introduced to work, at the beginning, it was a challenge for him to work and Study at the same time but it was a help for him, to learn on how to face the reality. 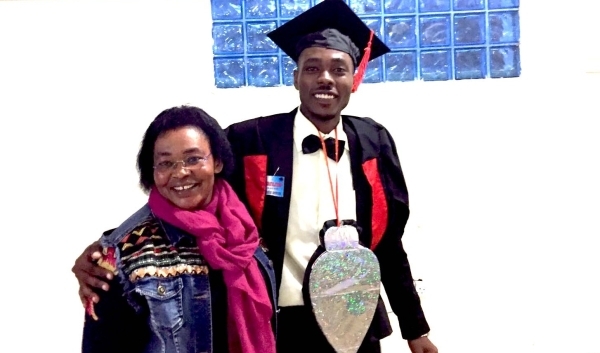 Thanks to MPI, Gashumba has managed to complete his diploma in social work and social administration and he is looking forward to upgrade in his studies. In Meeting point International we are happy that Gashumba Emmanuel discovered his Value, and he understood the value of his education despite all that he went through, we can still see that starting from the awareness of his value, Gashumba was able to find hope again and this allowed him to triumph. Story by Lumanyika Jude Bright.